Faith tosses the Unisphere and her cares away. I was blown away this morning reading Faith DaBrooke’s post about her first day at work as a woman. It brought tears of joy to my eyes. I was so happy for her. It is a big step and it is one I dream of taking someday. Congratulations, Faith! I never had allergies as a kid, but as I approached middle age, I started having allergy attacks. Nothing horrible; not worth going to a doctor to find out the cause (I think I am allergic to being a man). The thing about allergies is that when they start, I am not sure if I am getting a head cold or is it just an allergy attack that will go away soon enough. Tuesday evening, I felt the signs, so I popped an allergy tablet and a zinc cough drop. I felt a little better when I went to bed, but I had a lousy night’s sleep and awoke feeling worse, so I guessed that I was getting a cold and not being attacked by an allergy. Of course, the timing could not be worse for a head cold with a long holiday weekend ahead of me, followed by an outreach session on Tuesday. Our supply of cold medicines was depleted, so I popped another allergy tablet and a zinc cough drop and drove to work. An hour in and I feel pretty good, so I am crossing my fingers that it is not the start of a head cold. Tuesday, I will be out most of the day presenting as my true gender. Doing a little shopping and an outreach session at a Human Sexuality class at Southern Connecticut State University. I am so looking forward to a day out as a woman! Pretty Private Allan Murray femulates Marie of The Dumbells. As I wrote last month (here and here), I was not happy with my last new wig purchase. There were a couple of things wrong with the wig (the style and the color); the bottom line was that the wig made me look old! So I began looking for something else. Like most gurls, my head is larger than the average girl’s and I am always looking for something in large cap size wigs, rather than average cap size wigs. There is a big difference. With average cap size wigs, the wig seems to be constantly trying to jump ship and I have to go to the ladies’ room to anchor it back in place. With large cap size wigs, I slip it on my head and it stays in place until I am ready to remove it. Sadly, most wigs I have owned were small caps. The problem is that the available selection of large size cap wigs is limited. 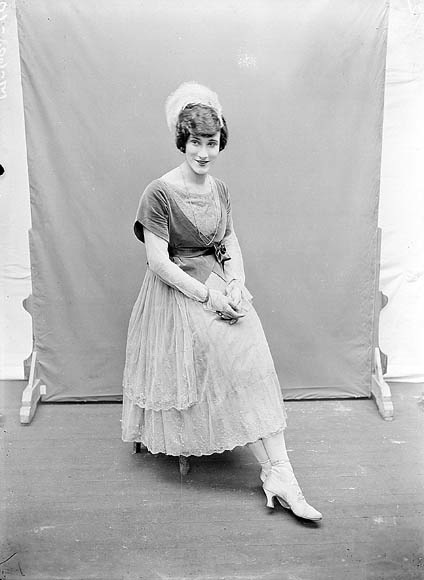 For example, wigs.com has approximately 800 women’s wigs to choose from on their web site, but only 22 are available with large caps. So I am always on the lookout for new large caps. During my search for something else, I found a new large cap from Noriko, my favorite wig brand. The wig is “Sky” and it has been available in average cap size for awhile, but just recently became available in large cap size, too. Check it out if you need a large cap size. I will be wearing Sky soon. I hope you enjoyed my live blog yesterday. The extraordinary high hit count (almost 8,000 pageviews) indicates that many of you checked back to keep up with the progress of my day. I thank you for your loyalty and interest. On the way home from work, I stopped by the Meriden Westfield mall. This once vibrant mall has declined like so many other malls and it was depressing to be there. Since I bought a new dress and suit at Dress Barn during lunch, I really was not looking for more clothes. Rather, I was looking to buy something to address a skin issue I have. So I went to Ulta for a solution, but all they offered was something to hide the issue rather than correct it. Next, I looked for help at the makeup counters in Macy’s, but I could not find a sales associate to assist me. So I high-heeled it out of there and drove home. When I arrived home, I tried on the suit that I bought at Dress Barn. Ever since I walked out of the store with that suit, I had buyer’s remorse. Usually, I don’t like the way I look in suits and I was not completely sold when I tried the new suit on in Dress Barn. But I was caught up in the moment and bought the suit anyway. Trying the suit on at home confirmed my doubts and I will return it today for a refund. So why do I do go to work presenting as a woman on Halloween? As I wrote last year, I love doing it, but there is a small ray of hope that someday I will be able to go to work (and go everywhere else) as a woman all the time. My Halloween fling is a test for me and my co-workers for when that wonderful day finally arrives and I think we all passed. 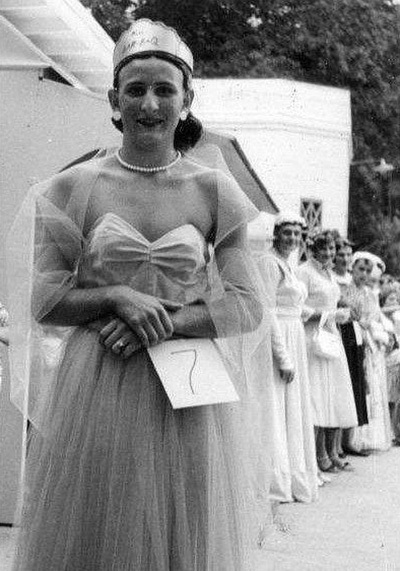 Contestants in a North Carolina womanless beauty pageant in 1955. Two weeks ago, I mentioned a Huffington Post article about a youngster who planned dress up as his hero, Bob the Drag Queen, for Halloween. Zoe alerted me that there is a follow-up article describing the youngster’s Halloween night out dressed as his hero. The story includes a video and both are very heart-warming. Catherine wrote that following the recent mention in Femulate of stockings, she wanted to alert us all to Gio Stockings in the UK. 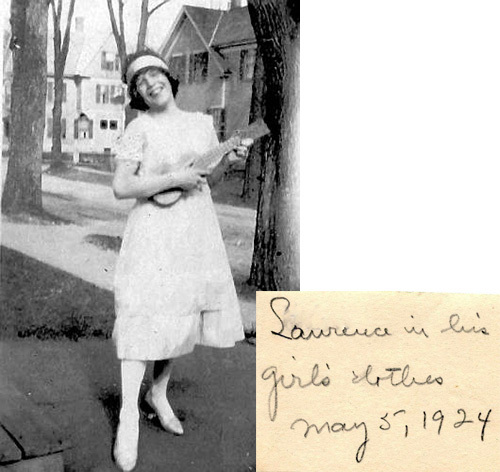 They are one of the world’s few remaining manufacturers of the full-fashioned stockings and need as much support as possible. Their website is www.giostockings.com and a sample of their offerings appear in the image below. Starla complained (and I concurred) that one thing bugs her about the film Tootsie. 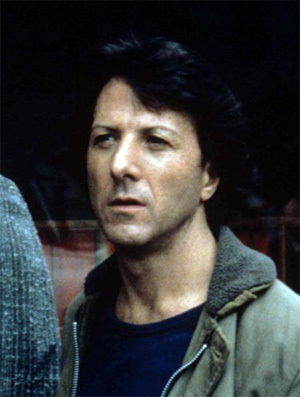 In the early scenes, before Dustin Hoffman’s character gets the inspiration to masquerade as a woman, you can see clearly that his eyebrows are already plucked and thinned to within an inch of their lives! Designer Christian Siriano femulates a mermaid for Halloween. The caption above is so true! So I bought a new pair to add to my hundred-plus pairs of heels, flats and everything in between. 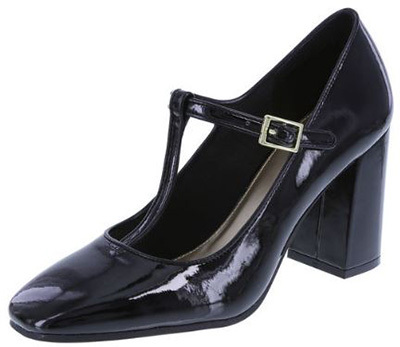 My new shoes are from Payless, their Haddie T-strap heel in black patent. The shoe is a throwback to styles of the late 1960s and in fact, is a dead ringer for the shoes I wore the first time I stepped out dressed as a woman. I had been eyeing Haddie ever since Payless introduced her a few months ago, but I held off making a purchase until it went on sale. My patience paid off and I bought Haddie for $14.99 ― $20 off the original price!